I absolutely love Alo Moves. It has become my favorite way of working out. However, I wish the app would work more like the website. I wish I’d be able to create different playlists. I love, love how the True Strength Beginner series has mini videos with movement break downs to watch before the actual video. I wish more classes had that so that I wouldn’t have to hear the same explanation every time. I dislike how most of the videos start with “Hi, I’m so-and-so and this is [insert class name]” followed by some loud music and shots of the instructor at different angles. Firstly, I literally just picked out this class and saw the name of both the instructor and the class. Secondly, I would like a “skip intro” option like in Netflix or just a general setting to disable them all throughout the app because I have to turn my ipad all the way up to hear the instructors talking but then the music is sooooo loud for ten seconds and then there’s no music again for the rest. I hope you add the ability for us to play our own music soon. I would welcome more knee-friendly classes. The functionality of the app is poor. I have the latest iPhone and the latest version of this app (both updates), and the app will not download the videos for offline use like it’s supposed to. I emailed customer support a week ago and still haven’t gotten a response. Lame. The app is great. It has a few little annoyances. But all is so worth it with the value that Alo classes and instructors have brought to my life. I use it daily. And there’s always something to adjust to your mood. Alo - keep up the good work! The classes are great, but there are a few issues with the app: when I am searching for a class and set a duration criteria I will get videos that are significantly longer than my cap; when searching for a class if I have the list view selected (which has the info about the class) half of the image and the description is cut off; finally, I really wish that it was marked somewhere that I have already completed a class so that I don’t start it only to realize I did it a few moths ago.... It would also be great if it were possible to save searches (for instance if I really like specific teachers it would be great to just be able to go in and have that list already saved). 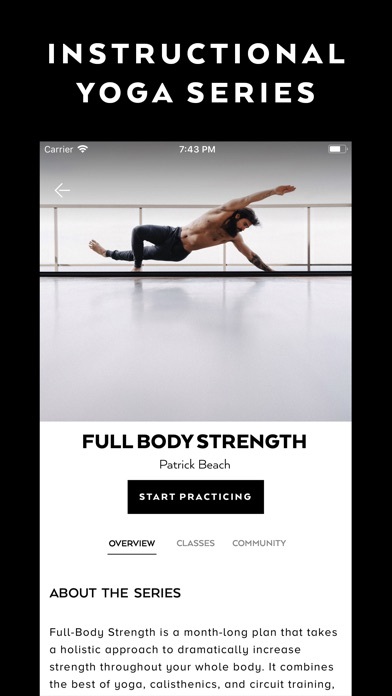 The app is a great option if you can’t get to a studio though and I love that I can download classes! This is an amazing app! 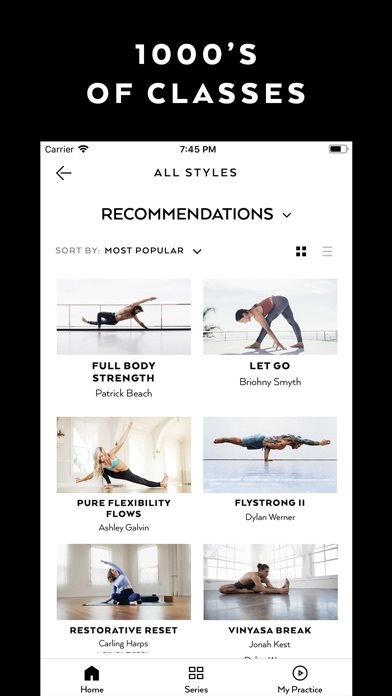 I’ve been trying to get into yoga and this app delivers exactly what I need. Varied, constantly growing content, wonderful instruction, and the ability to really carry out a yoga practice at home! As a young mom, THIS is what I need! These guys are for real, they’re clearly committed to personal transformation and I’m happy to see them succeed. I’m a happy subscriber and hope more people take advantage of this cool service. I got this app because I thought it was the follow-on to CodyApp, which carried Jessamyn Stanley’s videos for larger bodied beginners. They whitewashed/thin washed her right off the app. Worse, no amount of searching produced a plus size option or a non-orthorexic model yogi. Will be deleting immediately. Newsflash: plus ladies have MONEY. You fail at capitalism. Want to love and keep paying for the classes on this app but will have to stop soon if chromecast keep disconnecting ever few mins. Please fix! Seems like it’s been getting worse and it really interrupts my flow to keep reconnecting. The content on this app is fantastic. So much variety, something for all experience levels, different instructors so you can find someone you enjoy, the list goes on & on! As far as the app itself, it’s very user friendly & easy to navigate. The video quality is awesome. My one suggestion would be having the ability to cast videos from the app to the tv!